“Where do you work to look at animals and hug them? “What did the corn tortilla tell the wheat tortilla? 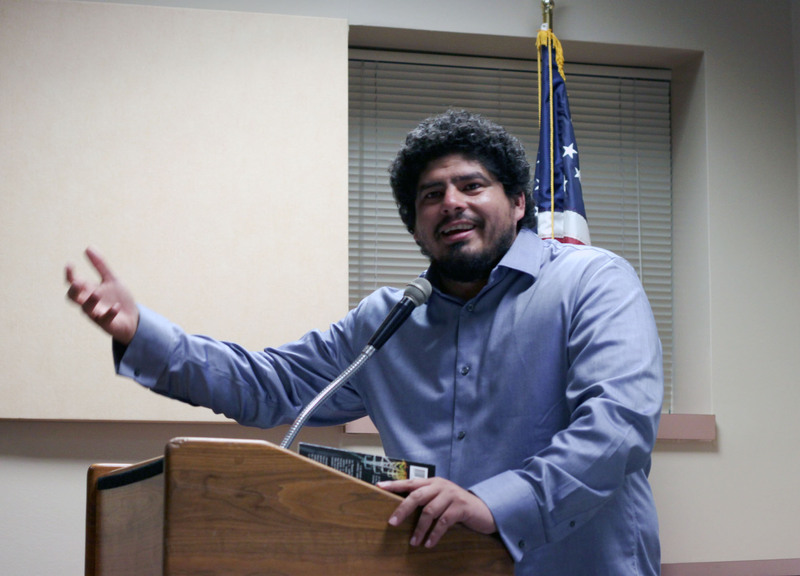 One usually doesn’t attend a poetry reading expecting to hear jokes— unless you’re coming to hear Javier O. Huerta, that is. Huerta’s jest transforms into “authentic wit” in his poetry, as Stalina Villareal, faculty scholar intern at Houston Community College-Southeast and Huerta-joke-impersonator said when introducing the poet to a filled Angela Morales Lecture Hall one Monday evening in September. Huerta is the author of Some Clarifications y otros poemas, a poetry collection published in 2007 by Arte Público Press and 31st Chicano/Latino Literary Prize winner. His forthcoming title, American Copia, is to be published April 30, 2012 by the same press. Huerta is currently working on his doctorate in English at the University of California, Berkeley and received his Creative Writing MFA from the Bilingual Program at The University of Texas at El Paso. He is a native of Nuevo Laredo but considers Houston his second home. He is an alumnus of the University of Houston and Houston Community College-Southeast. Huerta’s apparent simple jokes reflect the straightforwardly smart writing style in Some Clarifications y otros poemas. The combination of two languages to create a pun shows his appreciation and acrobatics with words, which he uses to create a bigger message in his poetry. The mixture of languages in his writing also reflects Huerta’s intention to join the Chicano Literature tradition. In his 43 poem collection for example, half of the poems are in Spanish. Huerta teaches a course at UC Berkley called “Documents and Literature of the Undocumented” which focuses on writers who were, or choose to write about undocumented immigrants. Though he has been a naturalized citizen since 2000, Huerta first crossed the U.S. border undocumented at 8-years old. “I still feel part of the immigration community,” he said. His collection acknowledges moments in immigrants’ lives with poems like “Coyote,” “El indocumentado le canta a México,” “amnesty,” and “Blasphemous Elegy for May 14 2003,” in which he pays respects to the immigrants that asphyxiated to death in a tractor-trailer in Victoria. Huerta knew he wanted to write when he took creative writing courses in his mid twenties at UH. Before then, the closest he came to creative writing was when crafting corridos when he was young and raps in high school. He attributes his time earning his MFA at UTEP as the turning point in his writing career, where he surrendered himself to the writer’s life and met friends from other cultures who spoke different “Spanishes,” which led him to further appreciate language and cultures. As opposed to many emerging writers, who have an anxiety to find their voice, Huerta describes his work in Some Clarifications as an imitation of greater poets. He finds readers usually admire a writer’s work, rather than the writer himself, and in this collection he chose to borrow the forms of his favorite poets. Through writing he hopes readers will have a connection to his work and seeks recognition from established writers. Huerta’s advice to writers or one who is thinking of pursuing a writing career is to focus on short-term goals, meet them and keep long-term goals in mind. Writers should know that one failed project could lead to a successful but that there will be rejection. Huerta is community oriented and is opposed to the notion that a writer must be a loner. Basing himself on the tradition of the epic poem to catalog, and the premise that there are an “abundant number of ways of expressing an idea,” Huerta compiled his grocery store experiences, added his friends’ and family’s and made up the rest. The style of American Copia will differ from his first poetry collection, though he still considers all he writes poetry. Erika, writer and photographer for EGMN, earned a Creative Writing B.A. from the University of Houston December 2010. Currently, she's trying to break the bad habit of eavesdropping on peoples' laughter.